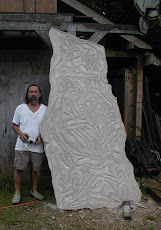 In May, I got a call regarding a sculpture I had installed a couple years ago wondering if I could provide another estimate to move and install it again. 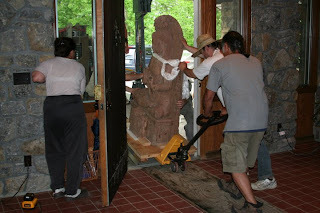 The sculpture was a stone Buddha that needed to be transported from Vienna, Va. to Berne, NY. I was driving, there was a lot of static over the phone and I asked that she email me what she wanted so I could understand the scope of the project. Details in her email included delivery and installation of Buddha asap to the Center for Wisdom and Compassion, a non-profit Buddhist lodge and retreat. There was a special event coming: the visit of His Holiness Sakya Trizin to bless the lodge and it would be special if the Buddha could be in place to receive his blessing too. He would arrive in two weeks and they had a limited budget. After a few calls I started to understand their request. I am not a Buddhist, but I honor him and those who believe. I had seen and heard the Dalai Lama speak years ago and his message of peace then is needed even more now. Researching Tibetan Buddhism, I began to see who Sakya Trizin is and what he represents. How could I help? Unfortunately, because of the budget it was not possible to do the project conventionally. There were a lot of steps and costs: packing/ rigging/transport/installation. However, because of the nature of the project, I found ways to reduce the price. 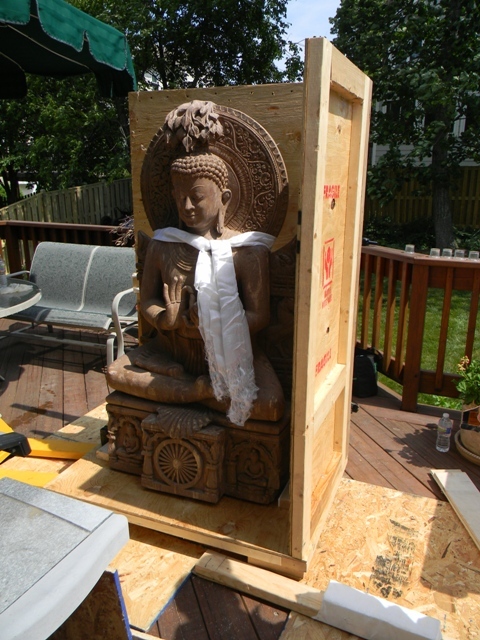 We originally used a small crane to rig Buddha onto the deck but I decided we could do without it and save there. I would make the crate and provide the crew for the de-install in Va. but the largest cost would be transport of that crew to Berne, NY for installation. As our discussions progressed I began to realize that I wanted this project very much to happen. It was becoming personal. I finally suggested I could install Buddha myself if they could have help when the Buddha and I arrived. I believed. I had been preparing for something like this for a long time. 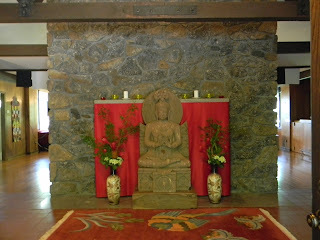 The Buddha is stone and weighs about 1,000 lbs. It was seated in a corner of a living room with the exit door 29" (w) leading to a raised back yard deck. Because of this limitation we packed Buddha outside. 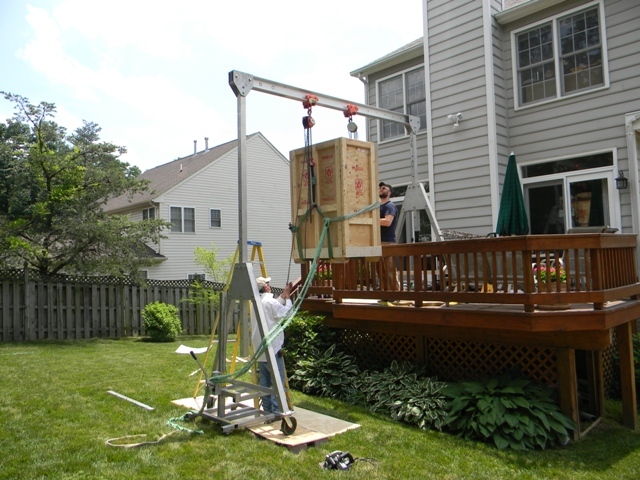 We were able to set up my gantry and rig it to the lawn. The gantry is aluminum, very light, with adjustable legs. We put the short leg on the deck and the long leg on the yard with the i-beam level. The rigged crate floated over the rail and landed softly on the grass below.